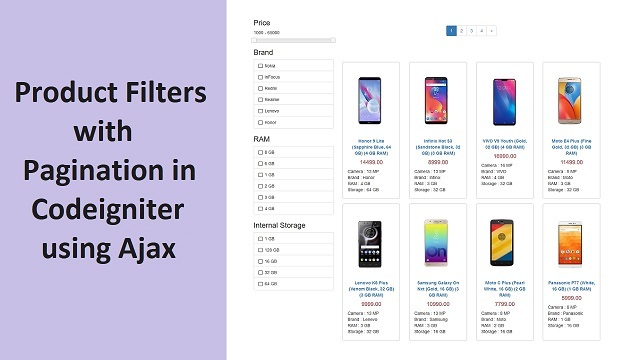 This post is for Codeigniter web developer, because in this post we have make stylish product filter in Codeigniter framework by using Ajax jQuery. In this product filter user can filter product details by different filter which we have make by using Checkbox, and even product can be filter on two price range. For make price range filter here we have use jQuery UI slider plugin. This all operation has been done by using jQuery Ajax with Codeigniter framework. In this Codeigniter ajax product filter we have also add pagination feature also. So, all product details will not be load on same page but it will be divided into different web page. So, it will reduce web page loading time. Here we have use Codeigniter pagination library for add pagination feature into Codeigniter product filter. If number of product load has been increase by limit to display on webpage, then in Codeigniter product filter it will automatically add pagination link. For go to one page to another page, here also we have use ajax also, so it will load another page product data without refresh of web page. So, this is Codeigniter product filter with pagination link using Ajax. In most of the ecommerce website all product has been display with differnt product filter with pagination link. There are also for filter product data input type checkbox has been used for filter product data on different condition. Sameway for filter product data between two price, for this here also we have use jQuery UI library slider plugin. When we have slide price, and stop slide then it will fire ajax request for fetch data and display product data on web page which come between two price. These are basic functionality of Codeigniter Ajax Product filter with pagination feature. Below you can find complete source code of this tutorial. $brand = $this->input->post('brand'); i can't find this input !! can we do this one using core php with ajax?